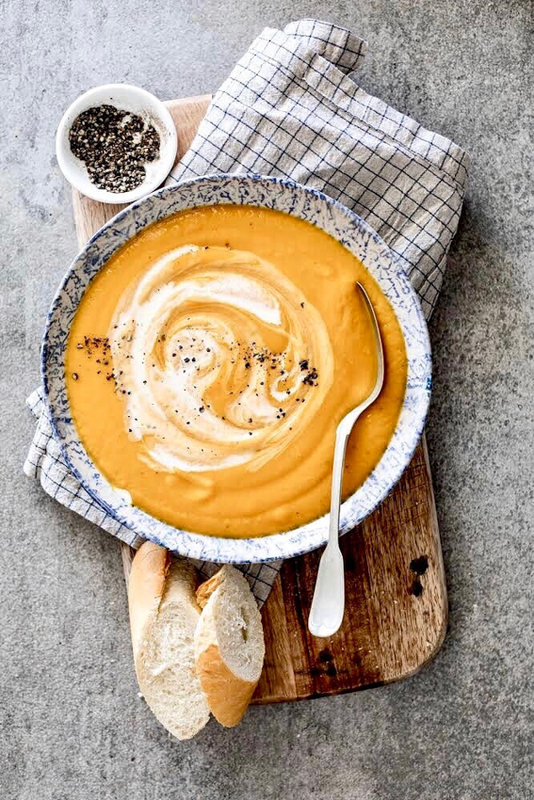 Honey roasted butternut squash soup is like a hug in a bowl and the perfect comforting fall meal. Perfect for making ahead, vegetarian and gluten-free! 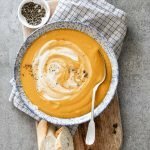 This honey roasted butternut squash soup is a constant feature during the colder months because it’s warm and comforting (I’m not joking when I say it’s like a hug in a bowl) and I can easily make a big pot in one go, ensuring we have a delicious, healthy and warming meal at the ready at all times. And who doesn’t love a big pot of soup? 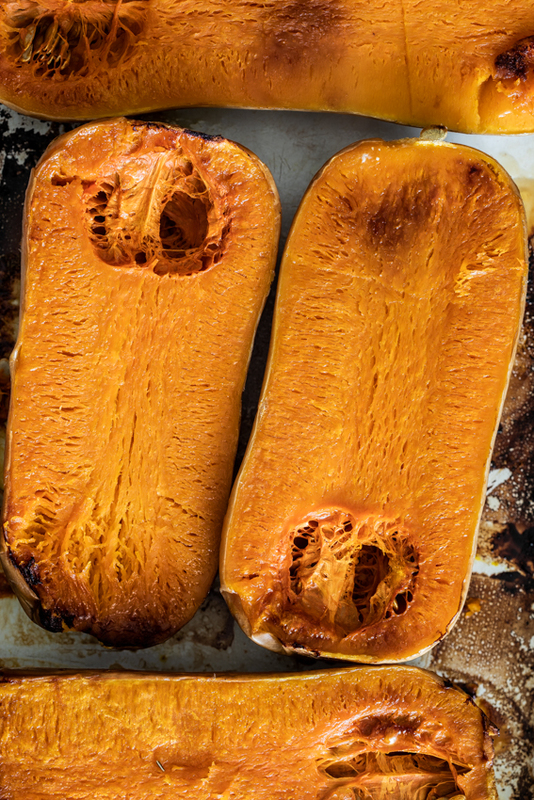 I prefer using whole butternut squash for this recipe, roasting the butternut with seeds and all until soft, and caramelized. I slice the butternut in half and then drizzle with olive oil and honey and season with salt and pepper. Place them cut-side down, add a splash of water to the pan and cover with foil. I roast them for an hour or so until they’re fork-tender. Scoop out the flesh and add to the soup base before cooking with the stock and blending. So easy! The soup base is made with loads of leeks, carrots, celery and onion and I always like adding garlic, thyme and bay leaves. Rosemary and sage are also great additions. 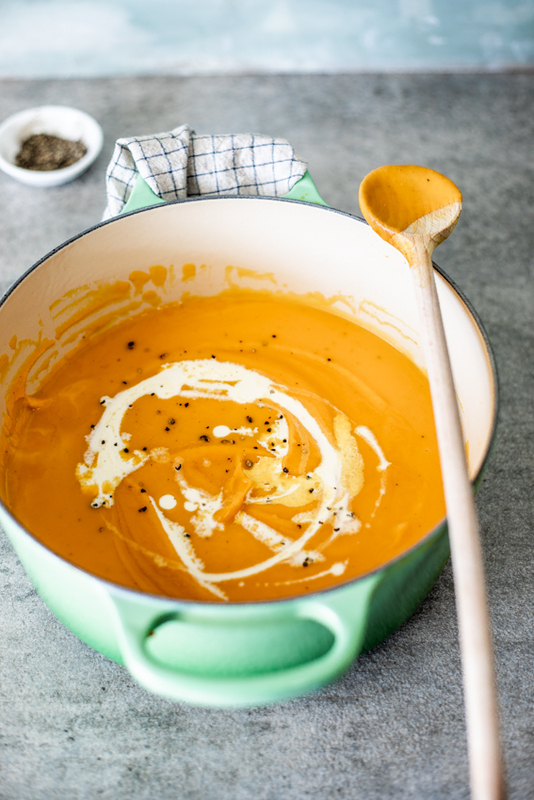 This easy butternut squash soup recipe is GREAT for freezing. 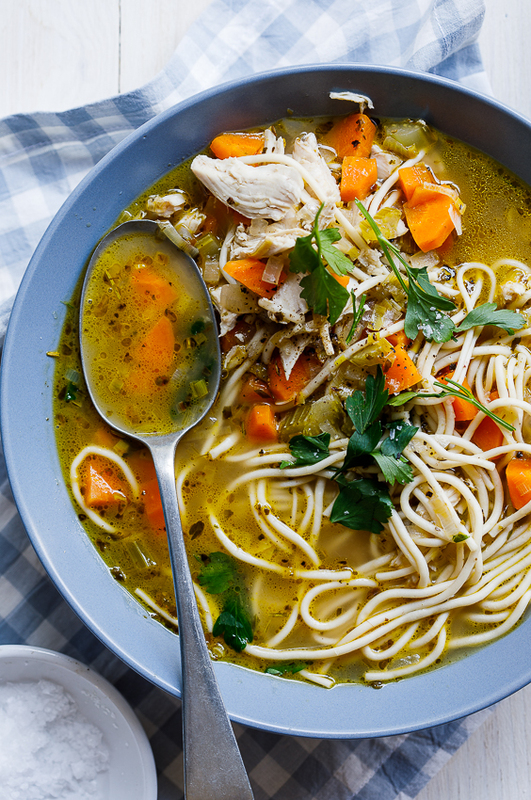 I usually make a double or triple quantity of the soup then freeze the remainder in smaller portions, perfect for defrosting and serving as a quick lunch or dinner. You could leave out the cream to make the soup even more stable when freezing but other than that, you can freeze it as is. 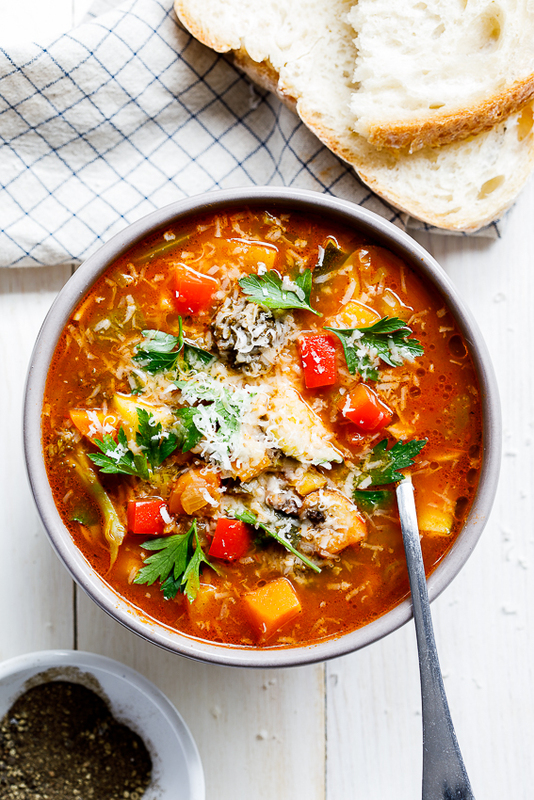 If you want to meal prep butternut or pumpkin soup ahead, you could skip the roasting and just place all the chopped vegetables in freezer bags ready to be added to your slow cooker or instant pot with stock and aromatics. 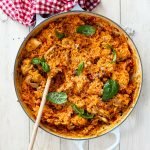 Of course the flavor will be slightly altered as roasting the butternut squash adds so much caramelized flavor but this is still a great way to get a delicious, healthy and easy meal on the table fast. 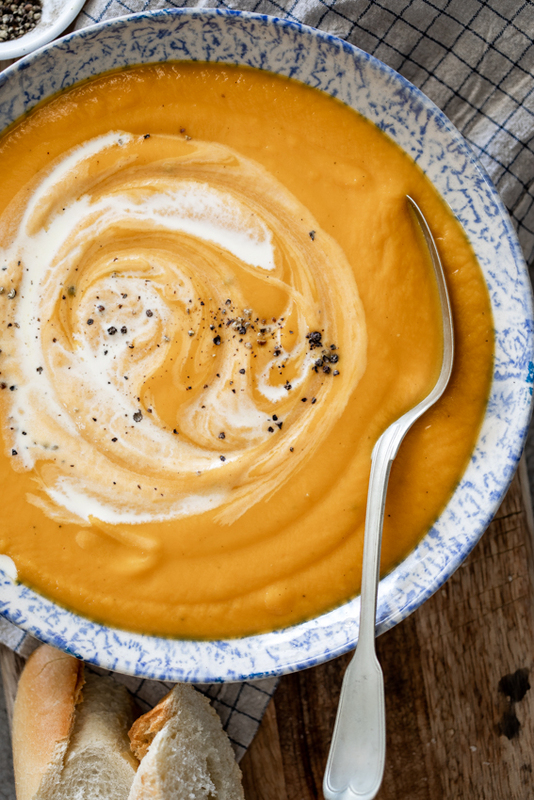 I always serve butternut squash or pumpkin soup with a swirl of cream but you can use yogurt or coconut cream if you’d prefer something lighter. Serve with some sliced baguette for a perfect fall dinner. Pre-heat the oven to 200º/400ºF. Generously drizzle the cut-side of the butternut with the olive oil and honey then season. Place cut-side down in a roasting pan then add 1 cup of water and cover with foil. Roast for 45-60 mins or until the butternut is completely tender and starting to caramelize. Remove from the oven then scoop out the flesh, discarding the skin and seeds. In a large pot, fry the leeks, celery, carrot and onion in a few tablespoons of olive oil/butter until soft and fragrant then add the garlic and herbs. Cook the soup base for 5-10 minutes until the vegetable just start to caramelize then add the roasted butternut and chicken stock. Reduce the heat and allow to simmer for 20-30 minutes until all the vegetable are cooked through and the stock has reduced slightly. Remove the herbs and transfer the soup to a blender then blend until completely smooth. Pour back into the pot and add the cream. Bring back up to a simmer, cooking for another 5 minutes then season to taste and serve. Made this earlier in the week and froze a batch, have had a portion for most late afternoon snacks. The honey is the perfect ‘finish offer’ – love it! So happy you liked it! Perfect for freezing ahead. A bowl full of comfort right there Alida! 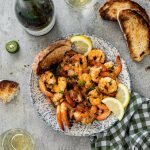 This recipe looks easy and delish! Definitely trying it soon!